I like it & it`s very good/strong...............but what is Heroic? I love this set and use Liens de précision du gladiateur dramatique with it. My weapon of choice right now is Themios le Porte-l'ombre, but Arathar, l'œil de la Flamme works very well too. 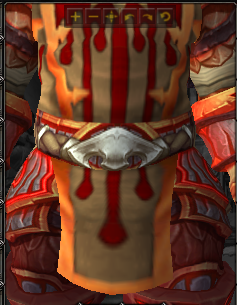 Looks pretty good with this transmog! Great yellow, red-reds. If you are looking for a matching cloak, Grande cape émousse-lame matches perfect if you ask me. Marshcreeper Belt is the best match I've been able to find for this set.